The licensed California contactors at Roll Out Shelves help homeowners throughout the San Francisco Bay Area add value to their homes with high quality space saving storage solutions. We will measure your cabinets, manufacture the product, and install them perfectly. "Having just moved into a new condo, we have worked with several vendors over the last few months and Perry is one of the best! He is professional from start to finish. His responsiveness, punctuality and quality are impressive. Thanks to Perry, our kitchen cabinets are now highly functional, with additional storage recognized. Great quality shelves and expert installation that I know will stand the test of time." Improve your kitchen cabinets, bathrooms, closets, tool rooms, or add roll out shelves for a variety of creative applications. Make a false drawer functional, turn a closet into a pantry, or transform an area into something more useful for your lifestyle. Roll Out Shelves takes onsite measurements, to make and install new roll out shelves at an affordable price. Hardwood drawer boxes can be made in any size you choose. Most installations are completed within one day. Get easy access to your favorite pieces or most-used items with full extension, heavy-duty rollouts. You can also make more space out of an otherwise non-usable area with u-shape roll out shelves around sink pipes. Roll out shelves are custom-made to fit your cabinet. 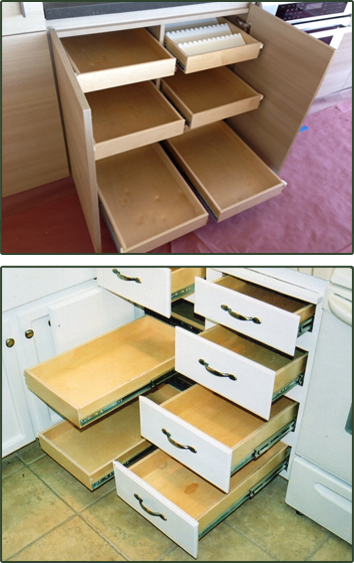 Improve your cabinets by rebuilding them from the inside with new drawer boxes. We remove old drawers, install new ones, while using your same front as your old drawer if preferred. You can expect only the best wood in our construction materials; we never use any particleboard or melamine. All of our roll out shelves are made with quality materials and cost much less than you might think. Drawers are built from solid wood and plywood veneers with dovetail-glued corner construction. The bottom of the drawer is one half-inch thick, nine-plywood veneer that's slotted into all four sides of the drawer box. The Accuride® 100-pound full extension slide, made from heavy steel with a quick release and a brake, is standard on all our drawers and roll out shelves. Feel better knowing your shelves are built with woods that all come from managed forests. Our sustainable products are approved by Forest Check.